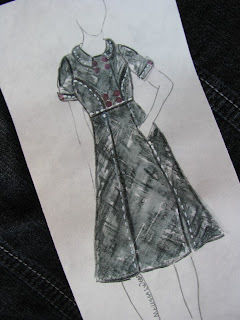 After visiting Shabby Apple Dresses I was motivated to put my BS Apparel Design degree to work and enter some original dress designs for their current contest. For years I have been creating original designs just ahead of the fashion curve. I have always dreamed about creating a design that would be manufactured for others to purchase. Often times I find myself looking for colors or designs that are not in the stores, so I create them myself. I am a conservative mother of 3 that likes to look fashionable but doesn't always feel fashion is for the more mature woman. When designing this collection I tried to keep the look classic and use current fabrics and techniques for embellishment. 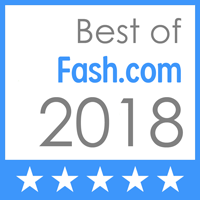 In this collection I used the same dress in 3 different colors and fabrics; All 3 versions focus on the lines created by the top stitching and all 3 have a neckline that can be worn buttoned closed or open laying flat. My inspiration for this dress design evolved from another entry for this same contest. For my original design entry I was inspired by a pair of denim jeans that had decorative top- stitching. I sketched many dresses while working out the designs. When sketching this design I was also inspired by a swing coat I own. The first sketch is show n using a black denim twill, brown wood buttons, and two rows of top stitching in taupe and white. Denim is for the more casual wearer and is popular with all women. This dress would be easy to care for and very comfortable. This style of dress could be dressed up with pumps or down with a fun pair of sandals. The collar could be worn open and a fun bright colored necklace could be worn to add a little spice. This dress could take you through all seasons and is a timeless classic. 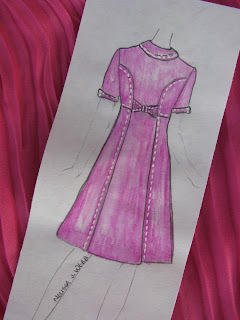 The second sketch shows the back of the dress in a hot pink soft cotton weave with white top-stitching. Fun white buttons are shown on the sleeves for an accent. The bow detail on the back brings in a feminine focal point and adds interest . The cotton fabric would allow the dress to breath and would be very comfortable on a hot summer day. This dress would be perfect for the woman that enjoys wearing color and walks with confidence. What better color to wear to an outdoor summer or spring wedding? 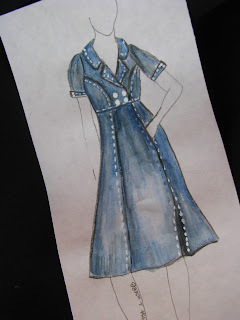 The third sketch shows the dress made of a navy crepe with white top stitching. This sketch shows the dress with the collar open creating a v-neckline instead of a rounded neckline. For the woman that has a long neck she will want to wear the collar closed while someone with a shorter neck will want to wear the neckline open helping create a long slim line. I chose navy because there are a number of women out there with cool colored skin wishing they could wear that basic black dress. Unfortunately black just washes them out. These women usually wear navy well. This dress would be a great alternative and perfect for those black tie events and formal nights out. All 3 versions include 8 buttons on the front of the dress and 2 smaller coordinating buttons on the sleeve cuff. All 3 versions would have self lined collars so the woman wearing the dress could choose to wear the collar buttoned up or laying flat open. The bodice of this dress would be a tailored fit while the skirt would be A-line and flared a bit. The front of the dress would have two slash pockets hidden in the seams and would naturally open at the left knee to help with movement. Both the navy and pink versions skirt would be lined with a light weight lining while the denim version would not be lined.